Grilled shrimp kabobs are a terrific light, fresh and delicious summer dinner. Fresh shrimp only takes a few minutes to cook on the grill, so they make for a quick meal. Not only that, but when you combine shrimp and vegetables on your kabobs, you can make an entire meal with very little mess. The key to delicious grilled shrimp kabobs is to select the best quality shrimp you can afford. Shrimp is available fresh, frozen or previously frozen. You can also purchase it in a variety of different forms including pre-cooked, raw, shelled and deveined or with the shell on. They are also available in a variety of sizes. If you are using fresh or previously frozen shrimp, it is essential that you use it within a day or two of purchase. When in doubt, rinse the shrimp and then sniff it. Does the shrimp appear slimy or have a fishy odor after rinsing it? If so, then it is best to throw out the shrimp. While you can buy both cooked and raw shrimp, the best shrimp to use for grilled shrimp skewers is raw. You just won't get the same flavor with pre-cooked shrimp.. Either fresh or frozen raw shrimp will work well for grilling. The advantage to frozen shrimp is that you can keep it in the freezer until you are ready to use it, so it has a longer shelf life. When you are ready to cook the shrimp, remove it from the freezer, place the shrimp on a colander and run cold water over the shrimp until it is thawed. Alternatively, you can also put the entire bag of frozen shrimp in a sink filled with cold water. Change the water every 30 minutes until the shrimp is entirely thawed. Shelled and Deveined or Unshelled? Shelled, deveined shrimp will cook more quickly and absorb more grilled flavor than unshelled shrimp. Shelled shrimp also gives you the advantage of being able to marinate it in order to add in additional flavor. Shrimp comes in a variety of sizes from tiny to jumbo. Choose shrimp anywhere from medium sizes all the way up to jumbo shrimp for your best grilling results. Placing your shrimp properly on skewers is essential when you are grilling. It not only makes the cooking process easier, but it also keeps the shrimp from slipping through the grill grates and into the fire. Typically, shrimp kabobs use either wooden or metal skewers. If you use wooden skewers, pre-soak them in water for 30 minutes to avoid flare ups on the grill. 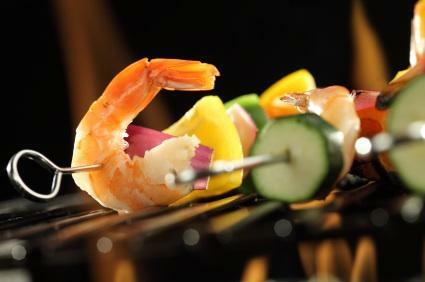 An alternative to wooden or metal skewers is to use sugar cane swizzle sticks (available at Melissa's and other online retailers) as a skewer for your shrimp. Using sugar cane actually impart a sweet flavor to the shrimp that is really delicious. Regardless of what type of skewer you use for the shrimp, be sure you don't overcrowd the skewers, or the shrimp will cook unevenly. The type of grill you choose to use depends on your personal preference. All grills work equally well. You can even use an indoor electrical grill such as a George Foreman grill to cook your shrimp. Before using the grill, prepare it by putting a little bit of oil on a paper towel and oiling the grill. While it isn't essential that you marinate your shrimp before grilling it, marinades can add extra flavor. You can marinate your shrimp in a simple marinade like a pre-made oil and vinegar style salad dressing, or you can combine oil, an acidic liquid such as fruit juice or vinegar and herbs to make your own marinade. Shrimp soaks up marinade quickly, so marinating for about 30 minutes in the refrigerator prior to cooking is adequate. The following recipe is a quick and easy recipe for grilled shrimp using sugar cane skewers. Combine the first five ingredients in a small bowl to make a marinade. Toss the marinade with the shrimp, cover in plastic and refrigerate for 30 minutes. Split each sugar cane swizzle stick in half lengthwise using a sharp knife. Skewer marinated shrimp onto the swizzle sticks. Combine the remaining ingredients in a small saucepan and bring them to a boil. Reduce the heat and simmer until it forms a syrup - about five minutes. Oil the grate with a small amount of oil. Brush the shrimp with the rum glaze and grill over high heat for about three minutes per side, until the shrimp is pink and opaque, basting the shrimp generously with the glaze while it cooks. Grilled shrimp kabobs don't need to be difficult. If you keep some shrimp in your freezer and skewers in your pantry, you'll be ready to have grilled shrimp skewers any night of the week.